Space Ludo is a space/SF version of Ludo, a traditional race and capture game enjoyed around the world. Ludo is related to Parcheesi, Trouble, Sorry, etc. All of them are simplified descendants of the ancient Indian cross and circle game, Pachisi. 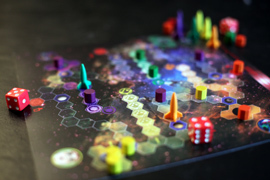 Space Ludo offers an addicting blend of luck and strategy. Dice are involved yet crucial choices occur frequently. The rules are simple yet the game is always interesting and pleasant to replay. Such are the hallmarks of a classic and so, Ludo has stood the test of time. The game utilizes the standard, widely known Ludo rules. These comprise the foundation of play and will be familiar to long time players. New players are encouraged to play the standard game first. Space Ludo adds the deathmatch element, wormholes and other optional rules to expand and enhance the game. The theme of Space Ludo comes from the spaced-out universe of the indie computer games Strange Adventures in Infinite Space and Weird Worlds: Return to Infinite Space.